Old skool gi company returns with an in yer face bling model that offers much bang for its buck. Despite its attractive offerings, its slightly unusual cut may not suit everyone and patch placement may be an issue. Readers can obtain a 10 percent discount (valid until 30th October) off all products on the made4fighters website. See below for full details. 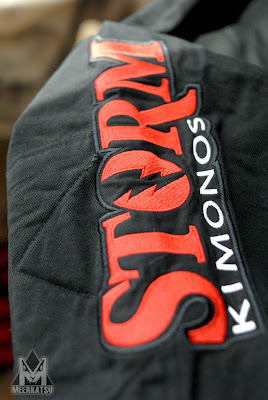 Storm kimonos have been going a long time – 1996 in fact. Just look at the cover of the classic book ‘Brazilian Jiu-Jitsu Theory and Practice’ and you’ll see Renzo Gracie rocking a Storm. 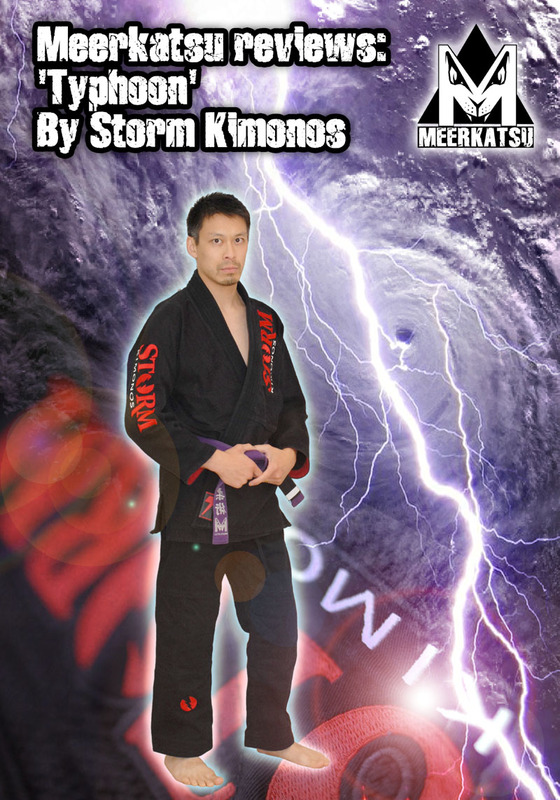 In fact he’s still endorsing the Storm kimono, alongside another World champion, Andre Galvao. 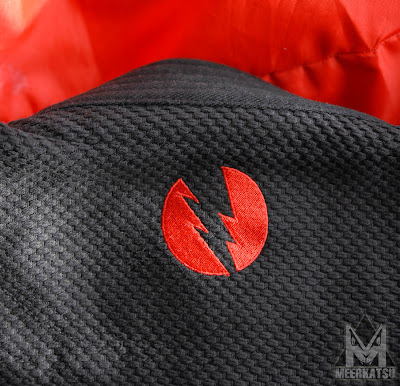 Storm began as a small company and remained so until fairly recently, when the owner joined forces with a large company, Aggressive Combatives, and decided to take the brand to a new level – the Chinese-made Typhoon is the result. The Typhoon gi is sold as a pre-shrunk gi. After several washes at 30 I found that the arms shrank a little, but the gi jacket and trouser length were mostly unaffected. Storm actually have a very comprehensive choose your size chart which you can find here. Based on the Storm chart I was able to identify the A1 as being closest to my size. 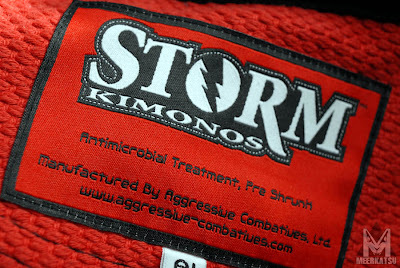 It is something most other gi makers should follow.The fabric is a basic judo style single weave – the same as found on my Roy Dean kimono, however the Storm gi is treated with an antibacterial coating. The Typhoon is not for the shy – it is pitched squarely at the BJJer who like a lot of ‘bling’ with their gi. The same person who covets flash brands such as Breakpoint, Lucky or Bull Terrier gis. The gi is adorned with huge ‘Storm’ patches on the chest, left arm and left trouser leg. There are also smaller circular lightning logos on the right trouser leg, behind the shoulders and the base of the lapel. 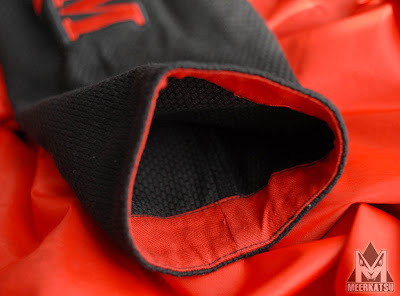 My black coloured gi had red lining details on the inside of the jacket. To top it off, the trousers contained a neat little ID/mouthguard pocket which was velcro fastened. The overall look of gi is incredibly attractive in my opinion – the arrangement of black and reds decorating the gi are wonderfully OTT without being distasteful. But some people have expressed concern over the legality at IBJJF competitions of the patch placements. However the press statement goes on to illustrate a case at this year’s Mundials where a competitor wearing the Storm Typhoon has been allowed to continue by a bullpen official. According to the official IBJJF guideline on the placement of patches (see below) it is clear that the Storm Typhoon gi more or less follows the legal areas where patches can be placed. The only argument is whether or not the large size of the patches complies with the rather vague regions indicated by the circles on the IBJJF diagram. If absolute IBJJF legality is your prime concern,. then it is probably safer to opt for another brand or at least bring a second, plainer gi, with you to the tournament. It should be noted however, that most regional and local tournaments will not be as strict as the IBJJF and the gi was quite happily used at the (non IBJJF) Abu Dhabi World ProGi event earlier this year. The Storm collar is soft and light, it may have a rubber core but it’s hard to tell as it is very flexible and soft, unlilke the Koral or Vulkans I have owned in the past. Regardless, it is suitably thick. There is also an extra layer of material that joins the lapel to the main body of the gi jacket. A nice extra reinforcement detail. The sleeves shrunk a bit in the wash ending up being a tad shorted than I would prefer. But the cuffs are heavily reinforced with neat red coloured seams. 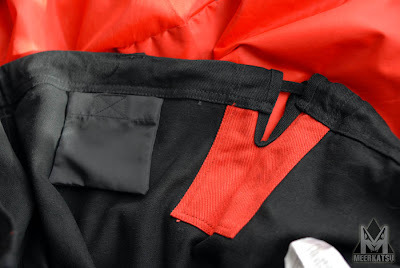 Red tape is also used to reinforce the jacket skirt, trouser ankles and many other areas. One could even say it is over-reinforced as some of the extra taping is very wide. 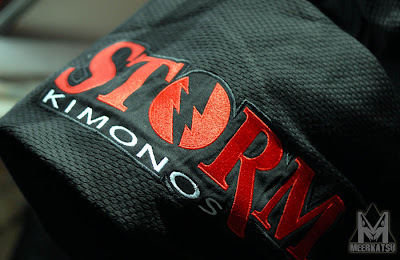 The Storm trousers are pretty thick cotton twill with the added feature of padded knees – not something you see a lot of with other BJJ uniforms. One thing I would have liked to have seen is a rope trouser cord instead of a flat one. 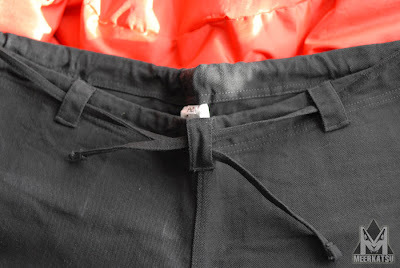 There are three belt loops, which I personally find annoying, I prefer either two or four…the middle loop is fiddly. Arguably the middle loop prevents the cord knot from riding above the trouser hem, but this rarely happens to me, or I certainly haven’t noticed an issue with this. 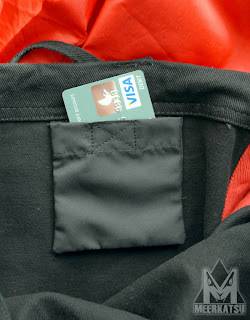 The ID/mouthguard pocket is a nice touch and the trousers are slim and the perfect length for my size. The first thing to note about this gi is the cut. As you can see from the photos below, the arms slope downwards whereas the Fushida behind it (and ALL other gis I have ever owned) are cut with arms perpendicular to the torso. 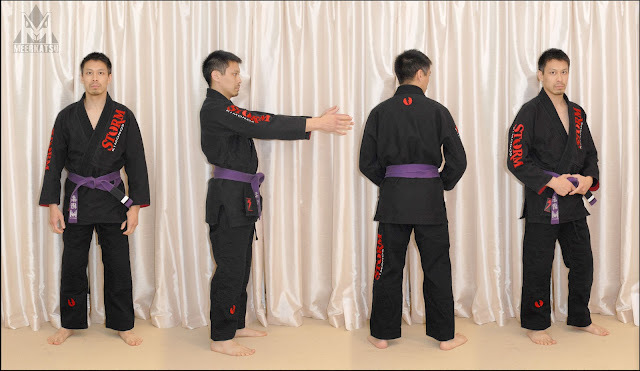 The result is a gi that curves over the shoulders and a collar that rises slightly higher behind the neck compared with other gis. It’s certainly something a little unusual. Yes, yes, I’m still wearing my belt too high. 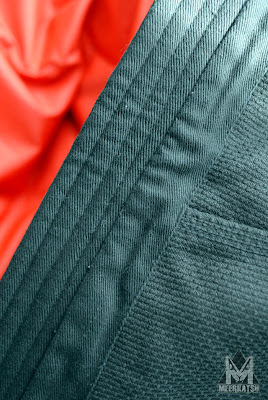 When I wore the gi in training I found the gi material to be soft and comfortable but something just didn’t seem right with the way it hung off my body. The gi jacket seemed very ‘open’ and the shoulders a little too wide for me – despite it being an A1 (traditionally A1’s are usually a bit too small for me). There was also the slightly nagging sensation of the rear collar riding up over the back of my neck whenever I hunched my shoulders. Of course all of these observations were made because I was consciously looking for things to report on. I guess over time I would get used to the Storm’s unique feel and it would be less of an issue, however I do feel that this gi is heavily designed for a different body shape to mine – the wide shoulders, sloping arms and narrow torso suggests the gi would be better off fitting a more chunky, muscley guy rather than me (skinny, long armed, weird body shape altogether). In fact I would say that if you have the same body shape as Renzo Gracie or Andre Galvao, then this is the perfect fitted gi for you. A training pal of mine also has this gi. He is the same height as me and a few kilos heavier but is much more muscley. The Storm fits him perfectly he says. Another thing I noticed during rolling were the thickness and stiffness of the patches. They are not only huge, but incredibly stiff. The patches themselves appear to be embroidered onto a thick block of material which is then sewn onto the gi fabric. That’s a lot of layers for a patch. The result was that the gi sits a little a heavy on the body and restricts movement to a small degree. One of the patches also had a loose thread. There are many things to consider if you are thinking of buying this gi: it is not a light gi, it is quite pricey and there may be issues concerning the patch placements. There is also the way the gi is designed – which may not suit all body types. But damn! It is a nice looking gi. In my opinion, the white version looks even better than the black. The weave is also very soft and comfortable and the trousers are slim and well designed. My guess is that this gi will sell on sight – you either love it or hate it. 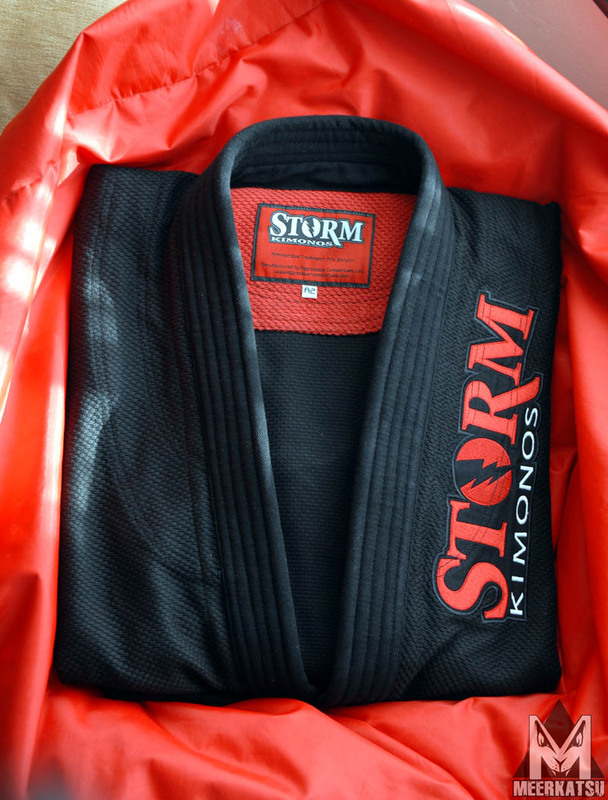 The Storm Typhoon is a beautiful gi that comes with a lot of extra features and well thought out design touches. But there are a few aspects to the cut that did not suit my body shape. 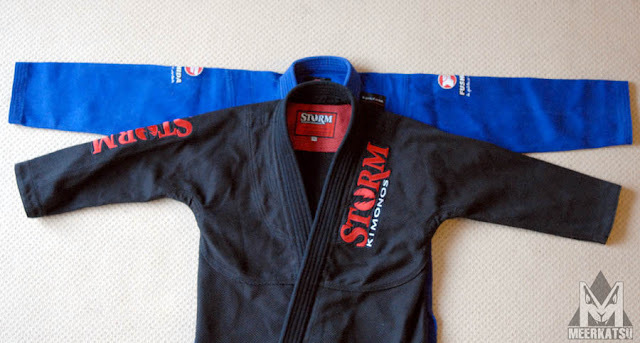 If you are fairly broad shouldered and are after an attractive uniform and are not too worried about strict IBJJF patch compliancy then you will be very happy with this comfortably soft and highly durable gi. I am not sponsored by any company and I do not endorse any one brand. The opinions expressed here are my own independent, unbiased views – yours may differ completely. Luke from BJJAsia also reviewed this gi so check out his views on the kimono. If you like what you’ve read and are tempted to buy something as a result, please mention ‘Meerkatsu’ as it helps me review more gear. 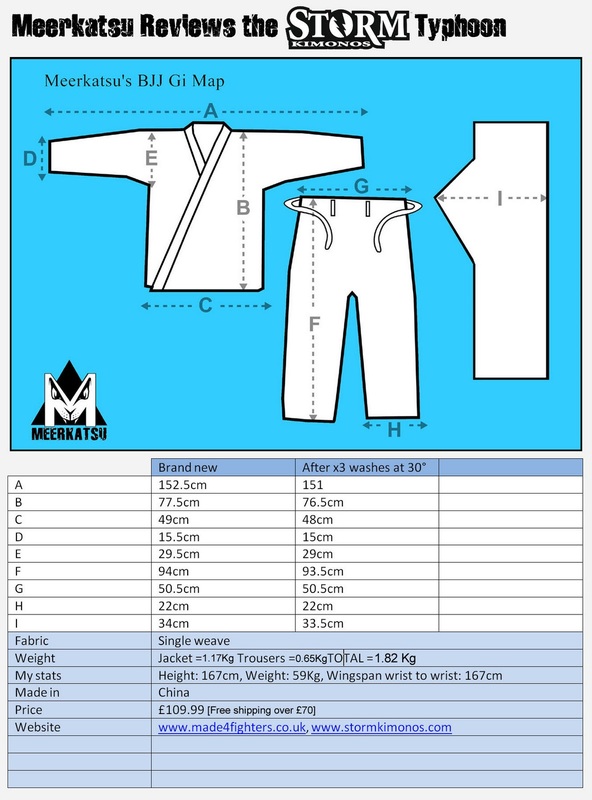 I would like to thank www.made4fighters.co.uk for supplying me with this gi and providing excellent feedback and service. Next post October 30 in Georgia: US Grappling Atlanta. 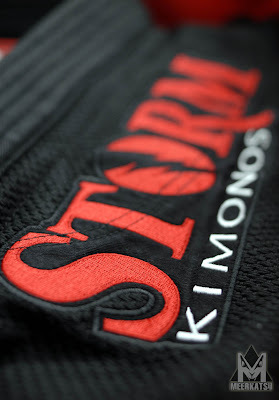 Previous post Kimura opens new training center in Taunton.